We've all had the rare joy of experiencing an artist for the first time who literally turns our head, someone whose music we hear and instantly know is destined for greatness. Such was our reaction upon discovering the jaw-dropping work of Mike Carss, who releases transcendent ambient music under his project name Altus. Not only is his music world-class, but he produces an amazing quantity of it. One would think that such a prolific artist would eventually hit some quality speed bumps, or at the very least run out of things to say. Not so with Altus; his every album is a master class and his every track can only be described as magical. Every time we listen to his music, we are struck with the awe-inspiring talent that this man has, and are blown away by the fact that he gives away everything he produces. Put simply, this man should be scoring films at the highest levels, and we do not have the slightest clue why he isn't already. And best of all, this master of the ambient form has chosen to release yet another album through Earth Mantra. 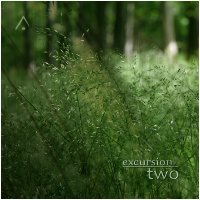 With Excursion Two, Altus has given us a pair of sublime, drifting ambient pieces of incomparable and immaculate beauty. The lushness of this music is palpable; while listening one is completely immersed, as if bathed in a cloud of purest light. Calling the music an 'excursion' is spot-on; it may be cliche to say it, but this music does indeed take the listener on a profound journey of pure bliss. We challenge you to listen to this stunning release and disagree. Earth Mantra is honored and blessed to be bringing our listeners the music of Altus. And we could not be more proud than to be bringing you Excursion Two. We think this is nothing less than music for the ages, and certainly one of the top releases of 2009. I subscribe to CalmRadio and use their sleep channel to fall asleep, but when they play Excursion 2, I can't fall asleep and if it is playing while I sleep, I wake right up and have to shut it off. I don't know why, but, although the piece is incredibly well composed and very powerful, to me, as a life long classically trained violinist, it expresses such a sadness (the descending "moaning" figure) with the extreme contrast of child-like bells that I cannot separate the sound of it with something terrible that someone is having to recover from. I am glad I found it online so that maybe if I listen to it while awake, it will lose the nightmarish power it has over me during the day! You can dive in a world of shimmering lights. Beautiful. Altus' recordings always sound great, and this is no exception. But it's more than just an exercise in production techniques. The music hangs in that profound space between new age and ambient (for those who care about labels), so it touches the soul while moving the emotions. Lovely stuff. Just heard Altus's 30-minute excursion on the Ultima Thule podcast--I immediately downloaded it. What amazing and transcendant music! Read the Sonic Immersion review here. I have been following the career of Altus for sometime. I am simply blown away at not only his undeniable talent, but his modesty as well. (See his blog and website). I am most impressed by this new release and I hope others will cherish it as much as I.
February 23, 2009 - Umberto D.
Exquisite. Once again Mr. Carss releases another masterful creation.I cannot put into words how I was affected upon listening to these pieces.Conceived by the mind but received by the heart.Music that transcends the ego and shows that we as humans too are part of this cosmos not apart from it. I was fortunate enough to stream this release while at work today - it's every bit as good as the liner notes make it to be. Can't wait to download and enjoy at home. I have almost all his albums. It's an amazing ambient artist. Thanks for EM for releasing his music.